Delight your loved one this Valentine's Day with our Classic heart shaped Valentine box filled with our romantic assortment of hand crafted petits fours. Decadent bite-sized cakes, layered with rich, flavorful buttercream and hand decorated with beautifully romantic designs such as rose buds and mini hearts. 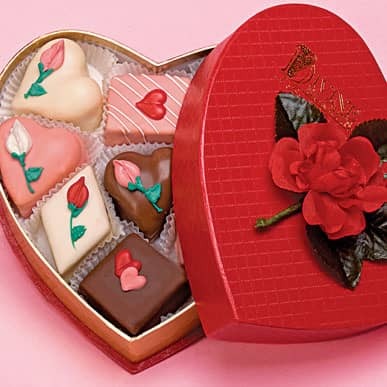 Flavors include Triple Chocolate hearts, White Chocolate Raspberry squares, Strawberry Creme triangles, Bittersweet Raspberry squares, White and Milk chocolate hearts and Bittersweet truffle diamonds.